Happy Friday! Welcome to another DT Challenge for Spellbinding Stamps by Nikki Burnette. 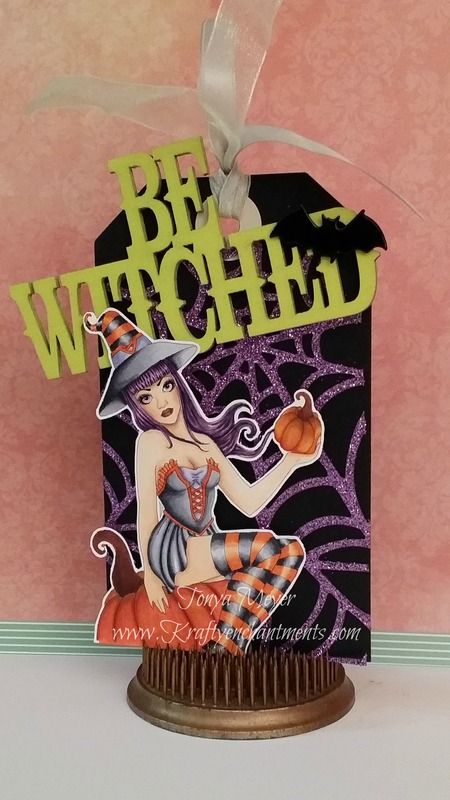 We’re a little over a week away from Halloween so what better time than to create some cute projects for this weeks challenge featuring witches. You can use any kind of witch but of course we’d love it if you’d use one of Nikki’s gorgeous witches. You can find the Etsy shop here. As a special treat, I have two projects to share with you today. I’m helping out my fellow DT Member, Jen who had an emergency and was unable to participate in this weeks challenge. First up is the tag I created featuring the beautiful witch, Coraline. For this project I used a black chalkboard tag as my base. The tag measures 3 1/2 inches x 6 inches. I used a Spiderweb die from the Anna Griffin 2015 Halloween collection. I die cut the spiderweb using some really pretty purple glitter cardstock. The die is quite a bit larger than my tag so I actually cut the borders off and trimmed a bit of additional excess to make the web fit onto my tag. I adhered the web to the tag front using some Ranger Glossy Accents. Next, I colored up Coraline using my Copic markers. I kept my color choices on the festive side with orange, black and a hint of purple. I also colored the pumpkin she’s holding and the one she’s sitting on. I used a bit darker shade of orange blends to have a distinction between her leggings and the pumpkins. Once I’d finished coloring her, I fussy cut her out and added some dimensional foam strips to the back of her. 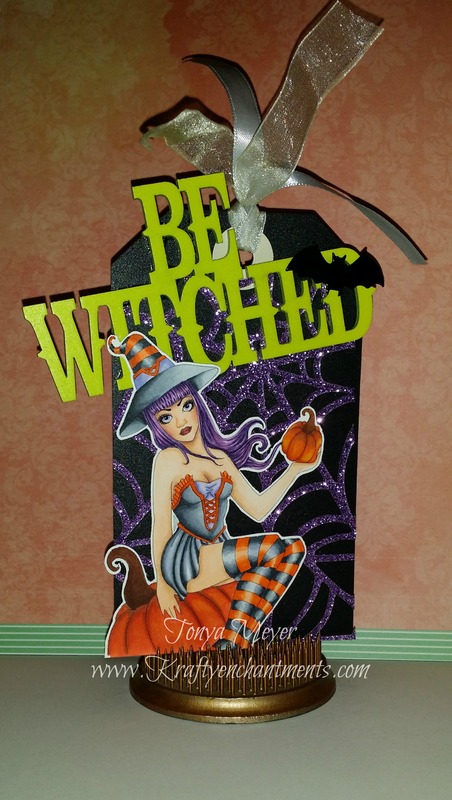 I used a wood cut sentiment, Be Witched and glued it to the front of the tag at an angle using a generous amount of Ranger Glossy Accents. I had a metal bat brad left from some that I’d purchased. I cut off the metal tabs on the back of it with some wire snips and then I added some dimensional foam to the back of the bat. I put the bat directly on my woodcut. To finish off my tag, I used a couple of different kinds of ribbon and tied a knot in the top of the tag. Here’s a look at the finished piece. The funny thing about my woodcut sentiment is that it caught my attention because of the bright green color. Turns out that it seems to glow in the dark a bit. Something I discovered when I was taking my pictures for this blog post. So a bit of a bonus for this project. You can kind of see the glowing effect from this picture, even her hair looks like it’s glowing purple. I kept this project pretty simple, but with the tag size being smaller than a normal card I didn’t want to overwhelm the project with too many extra embellishments & stuff. For my second project, I’m actually sharing a very special card that I made quite a while back but haven’t shared with anyone until now. This card fits with the witch theme for this week. What makes this special for me is that it is the project I created for my application project for the Spellbinding Stamps Design Team. For those of you that aren’t familiar with DT’s, they usually want to see samples of your work, however they may also ask that you create a project using one of their stamps whether it’s digital or rubber stamp. This card was created using the digital stamp Ashlyn which can be found in the Spellbinding Stamps Etsy shop. 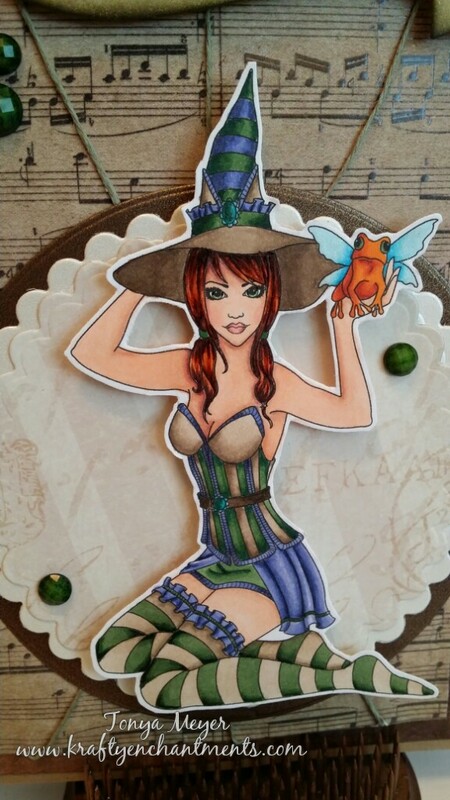 I colored Ashlyn with my Copics, added some clear Wink of Stella to the frogs wings and the brooch details on Ashlyn’s hat and belt and then fussy cut her out. Ashlyn and her frog were colored with Copic Markers and a bit of clear Wink of Stella was added to the frog and her brooches. Next, I started creating my background by using a few of my Spellbinders circle dies and scalloped circle dies. I cut a large circle from some dark brown cardstock and then cut two smaller scalloped circles, one with a shimmering cream cardstock and the other with a neutral pattern. I set each of my circles aside. Then I started working on my card base which was from a kraft cardstock which was cut to a 5 x 7 or an A7 size card. Next I used my largest rectangle die from Spellbinders and cut a piece of brown patterned paper. It’s hard to tell from the pictures but this paper is a matte color but it has these clear swirls design all over it. I cut my rectangle 1/8 inch smaller than my A7 card base. I cut another rectangle out of a cardstock of sheet music. I wrapped trio of neutral twine around this later and firmly adhered them on the back. Finally I assembled by die cut circles and scalloped circles on top of the sheet music and then added Ashlyn to the front circle with some dimensional foam. For my sentiment, I used a die set from Paper Smooches called Streamers and I created the sentiment, “Have a Magical Day!” on my printer and printed it onto some white cardstock and then used one of the Streamers dies to cut it out. I added a bit of Walnut Distress ink to the banner so that it would match the color tone of the rest of the card. 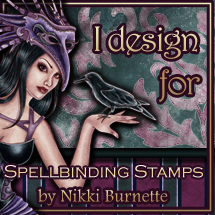 So now it’s your turn to play along with the Design Team for Spellbinding Stamps by Nikki Burnette. You know you still have a few Halloween cards to get done before munchkins head out to Trick or Treat. Head on over to the Etsy shop here and pick out a couple of bewitching images to play along in this weeks challenge. Also be sure to stop by the blog here to check out what fun things my other team members have created for you this week. You can also find lots of inspiration over on our Facebook Group here. Thanks for stopping by, hope you enjoyed these projects and that they inspire you to create something witchy this week. Great job coloring these stamps! I love your tag – very festive! Thanks Miss Carisa! Much appreciated!